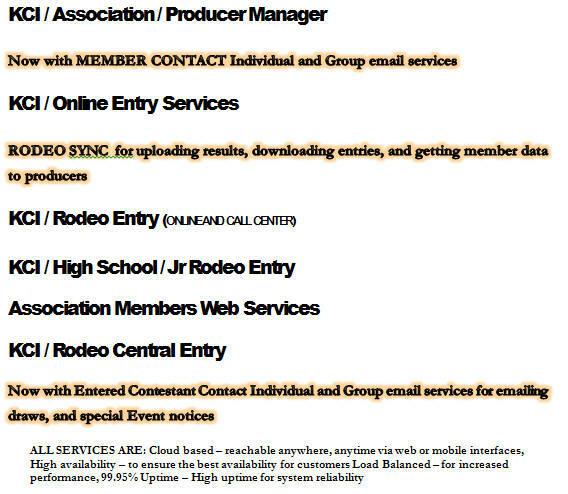 Our previous software products Association Manager/ Rodeo Central Entry/ and our Online Entry-Web Services have been combined into one online (cloud based) software application, WEB SERVICES for Rodeo/ Equine Associations/Event Producers/Clubs that allows you to pick and choose the services that YOU need. ALL OF THESE SERVICES INTEGRATE (UPLOAD & DOWNLOAD) WITH OUR INDUSTRY STANDARD ARENA MANAGEMENT SOFTWARE for local onsite event management. Equine event software for barrel racing, rodeo, team roping, and team penning / team sorting events. Easy "point & click" entries, draws, results, check writing, keeps season and series points and earnings for your contestants. Ideal for the private producer, roping clubs, barrel racing district groups, cowboy churches, and high school rodeo, junior rodeo, gymkhana groups. Solutions & Services KCI offers advanced sports event, member management and event entry solutions. which boost efficiency, productivity and profitability in event production and facility use. How does it work? Quite simply, our sports event, member management and event entry solutions work because our products and services are designed in the field and tested in the field by top producers all over the U.S.A., Canada, and Australia. We don’t stop there, KCI also collaborates with the industries leading event producers and sports sanctioning associations to deliver products that not only have the features and formats you want, but the foundation you need to run your operations over the years to come.